Next week I will speak at the 2012, STL-ODN Conference. The day’s theme: The Shifting Role of Organization Development in Business. 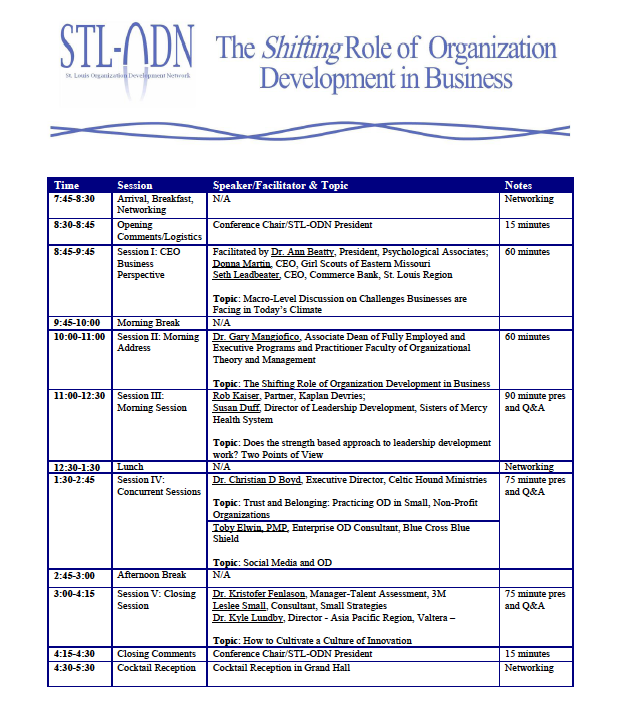 The entire day’s agenda for St. Louis Organization Development Network [for those not familiar with the ODN acronym] is a topic near dear to my heart. So, OD [either organization development or organizational development, choose your poison] and its role in business is the event. Highly relevant, as we do live in times where if a professional can not directly affect business results there is little opportunity at the business table. Rob Kaiser and Susan Duff incite a riot with 2 different views Does the Strength Based Approach to Leadership Development Work? I am honored for a spot in a lineup of a group of battle-tested professionals undaunted in our on-going struggle to help organizations and people develop excellence. I can not imagine a better group of people to be around, think with, and learn from. Does organization development have a public relations issue? A branding issue? An academic ivory-tower-issue? What a topic rife for dialogue amongst our navel-gazing brethren: ask 10 people what OD means half mention drug addiction, well those in and around OD do use the term intervention, the rest: unsure. So, who do we help? Many thanks to The St. Louis Organization Development Network for reaching out and inviting me. Congratulations Toby, wish I could be there to see your presentation in person. I look forward to the follow-up slideshow and reading about your experience at the conference. I have been enjoying your blog. I appreciate the comment. I look forward to the interaction at such a great gathering. Why aren’t you there? Well done mate, wishing you all the best. Been a distinct challenge putting this together. I have had my head down trying to figure a way to engage such a great community. Has distracted me from engaging our conversations on Theory X and Theory Y – I will get back on that soon. When are you and I going to be on the same panel, somewhere. Now, I’d pay for that privilege. Fantastic material and presentation today, Toby! I will need a few days to noodle it all… So much to think about and explore in your slide deck. Thanks for being a part of our community today! Thank you for the feedback and comment. I enjoyed being part of a great day and invited into such a great community of practice. I look forward to seeing the other presenters, some great thoughts for me to take along and learn from.